Egypt Dauod Ibarr Dean is the son of singer Alicia Keys and musician Swizz Beatz. The party was jungle themed and guests played with live animals such as a yellow boa and small fox. There was face painting and silly mirrors. Among the famous guests were Carmelo, LaLa and Kiyan Anthony, Pharell Williams and even Elmo! The birthday boy wore an adorable all black ensemble, a blazer, black old school Mickey Mouse tee and really cute sneakers with pandas! Egypt has three half-siblings, Prince Nasir (12 years old), Kasseem (6 years old) and Nicole (4 years old) . “We’re so excited for our Lil boys bday today!! Thank u for all of your beautiful birthday wishes! 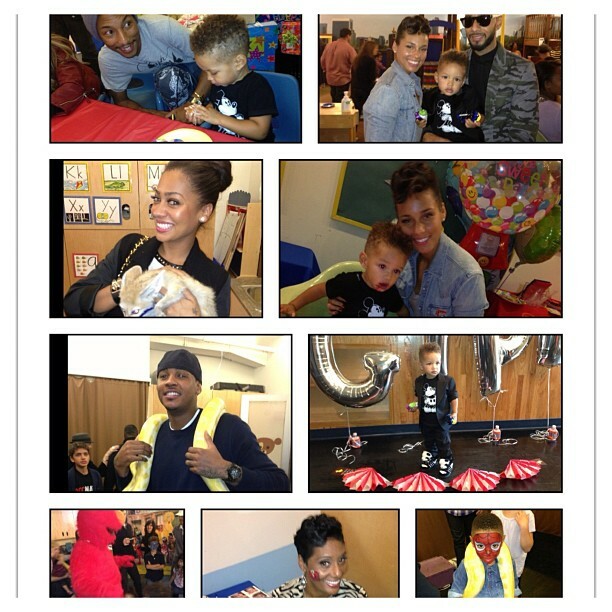 !” – mama Alicia on her son’s second birthday. This entry was posted in Celebrity and tagged alicia keys, carmelo anthony, egypt dean, egypt dean birthday, lala anthony, pharell williams, swizz beats. Bookmark the permalink.